Hi friends! I hope that you are well. I'm still dealing with my shoulder injury but it seems to be getting better. I'm sure it will be fine in a few days. A gal I follow on Instagram, Natalie Elphinstone, has been doing this challenge of sorts called The 100 Days Project. Basically, you do a creative task everyday for 100 days and you record your efforts. 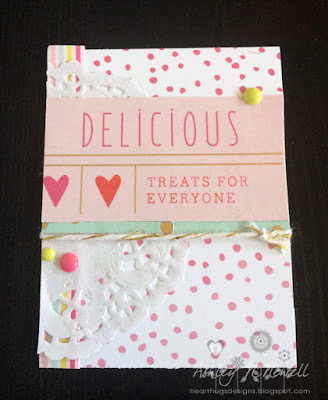 She was doing hers with pocket scrapbooking cards and I just LOVE that idea! I also loved reading her captions about what she was trying, why she made what she did, and what she was learning about her her style. I haven't been crafting regularly and I need it. I can feel that I'm not centered. I made this 3x4 card today. I don't love it but I think that's part of the process, to figure out what your style is and to experiment with techniques and products. I used papers from Dear Lizzy Fine and Dandy. The enamel dots are from My Mind's Eye, the doily is from Recollections, and I used Whisker Graphics Gold Metallic Divine Twine. I have a small group of friends who will be attempting this challenge with me. We have a Facebook group to support each other and share our creations. We are starting on August 1. If you'd like to join, please message me on Facebook or drop me an email. Have a wonderful day, friends! Super cute! I love the doily and want to craft with them more myself! Love that you are giving yourself this challenge - I totally agree about the not feeling centered if you're not crafting!